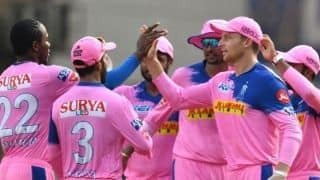 End of over 20 ( 10 Runs )RR 170/7 Stuart Binny* 33(11)Jaydev Unadkat 0(0) 30 runs for Stuart Binny 19.6Mohammed Shami to Stuart Binny. FOUR, FOUR! It does not matter though! PUNJAB WIN BY 12 RUNS! A length ball on off and Binny gets under the ball and gets it over cover. Agarwal runs from long off to try and stop the ball but fails to keep it in. No harm done. Punjab win and the crowd here is going bonkers. A win after two losses. Very important one! 19.5Mohammed Shami to Stuart Binny. 2 runs, Full on off, Binny strokes it wide of cover and gets a couple. 19.4Mohammed Shami to Stuart Binny. 2 runs, Yorker on middle and leg, Binny moves back and hits it towards long on. Mayank Agarwal gets to the ball and throws it at the keeper's end. Pooran demolishes the stumps but Binny is quick and gets the second easily. 19.3Mohammed Shami to Stuart Binny. 2 runs, Bit of a fumble but does not cost much. Full and straight on middle, Binny hoists it hard towards long off. Mayank Agarwal there misfields it but then saves it with a dive. Two taken. 19.2Mohammed Shami to Stuart Binny. no run, DOT BALL! Gayle with some antics as well. A yorker on the leg stump line, Binny tries to get under it but fails to time the ball. 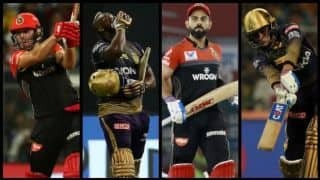 All he can do is dig it out towards point and the ball goes just as far as Gayle there who acts coyly trying to let the ball through allowing Binny to go for a single which he surely is not going to take. 19.1Mohammed Shami to Shreyas Gopal. out, OUT! 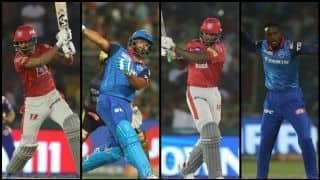 Agarwal does not have to move and the crowd in Mohali has found its voice again! A length ball on middle and leg, Gopal wanted the big one and goes through with a slog. 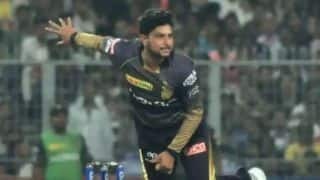 Can't free his arms and the ball goes high towards long off where Mayank is stationed and takes the catch comfortably. 23 needed in 5 balls now, Binny back on strike. End of over 19 ( 14 Runs )RR 160/6 Stuart Binny* 23(6)Shreyas Gopal 0(0) 18.6Arshdeep Singh to Stuart Binny. SIX, SIX! Just the way Rajasthan wanted the over to finish. 23 needed off the last over now. Binny has given them slight hope here. Full ball on middle and leg, Binny smokes it straight into the sightscreen. 18.5Arshdeep Singh to Stuart Binny. no run, Fuller outside off, Binny swings his bat but misses. 150 runs for RR 150 runs for RR 18.4Arshdeep Singh to Stuart Binny. SIX, SIX! This is out of here. Why didn't Rahane give Binny the strike early? Can he pull a rabbit out of his hat here? Back of a length ball on off, Binny lofts it high and over the mid-wicket fence for a maximum. 18.3Arshdeep Singh to Ajinkya Rahane. out, OUT! Arshdeep Singh is showing his class and composure in his very first game. Rahane cannot do much and has to walk back. Length ball around off, Rahane gets on one knee and looks to sweep it. He just manages to get a top edge and the ball goes behind. Mohammed Shami from short third man runs to his left and takes a very good catch. 35 needed off 9 balls. 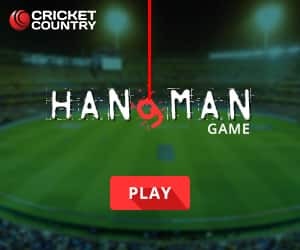 18.2Arshdeep Singh to Ajinkya Rahane. 2 runs, Good length ball on off, Rahane flat bats it over cover and wide of the fielder in the deep. Gets a couple. 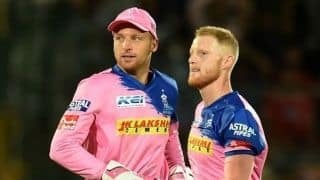 It’s time for version 2.0 of the match that triggered perhaps the biggest controversy of the season when R Ashwin ran Jos Buttler out at the non-striker’s end. And even though Kings XI Punjab have been far more superior than Rajasthan Royals this season, both two teams are separated by two spots on the points-table. 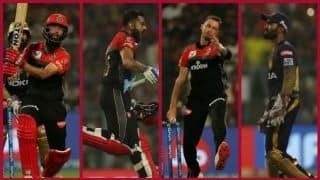 The Royals broke their losing spree against Mumbai Indians, while KXIP took a defeat from the Royal Challengers Bangalore, which was their first at home this year. 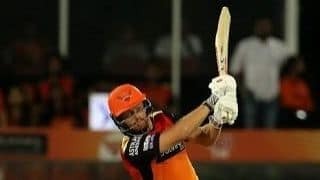 They’re coming off consecutive defeats and would be keen on re-enter the top 4, having pushed down by a resurgent Delhi Capitals. That said, as we get set to enter a key phase of the tournament, there room for error is bare minimum. KXIP’s fielding was sloppy in the previous game, with catches being put down and multiple errors committed on the outfield. That’s a slide they’d want to arrest urgently. The Royals have issues of their own to address. 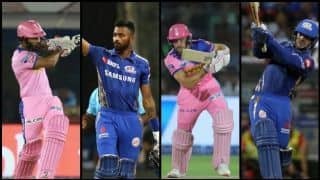 Their win against Mumbai highlighted some glaring concerns for Ajinkya Rahane and his side, the biggest being a fragile lower order. 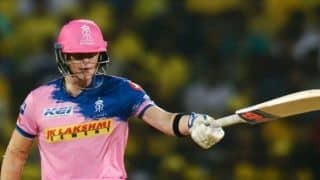 Mumbai Indians almost escaped with a win after their middle order collapsed for 27 for 4 with Sanju Samson, Rahul Tripathi, Liam Livingstone and Steve Smith perishing in quick succession. It was also the same middle order that costed RR the match when the two teams had met earlier this year. KXIP will next play their home match in May. Hence, before embarking on a long away stretch, they’d want to ensure that the Royals’ joy remains short-lived.